When Jason's sister moved to London last spring with her husband and their two kids, we were excited to have a reason to visit such a wonderful city. We were even more excited when they suggested we spend the holidays with them. We had visions of London's multitude of museums and thriving nightlife. We considered day trips and overnight trips outside of the city. We reveled at the idea of spending time with our niece and nephew, and to be there on Christmas morning to see them behold the glorious pile of presents waiting for them to annihilate open. He wasn't supposed to come until after we'd left London, but he clearly wanted to meet the Christmas visitors! 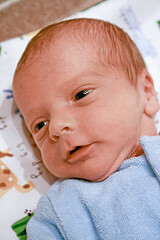 Cal's arrival led to a total reshuffle at the house, which now had four houseguests and a newborn in addition to its normal complement of four. Everybody tried to help out as much as they could. For my part, I "helped" by facilitating the baby's naps. With Cal's arrival, everybody stuck close to home for the first part of our stay. That meant when Henry (the oldest of the kids) started up with the stomach flu on Christmas Eve, it turned into the Christmas Day Massacre. Though nobody was sick for more than 24 hours (and don't worry, Henry was back at 100% on Christmas morning! ), the kid took down both of his parents, his Uncle Jason, and his grandpa for part or all of Christmas Day. I took the opportunity to come down with a terrible sore throat and cold that lasted a few days as well. Post-Christmas sales are really great over there, and that includes yarn! 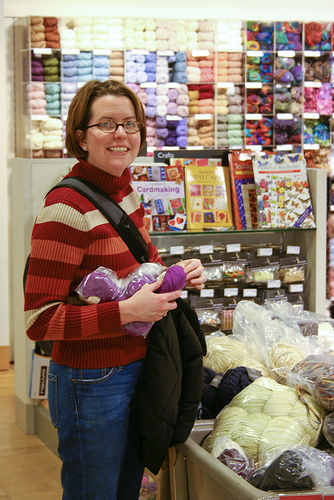 I got the yarn that's in my hands above -- six balls of Debbie Bliss Cathay in bright purple -- for under $20! I did a fair amount of knitting on this trip as well, but those updates will have to wait until next time. I'm still recovering, and we're off to Boston this weekend so I've got to get caught up on sleep, laundry, and sanity. �Feliz A�o Nuevo! aunque sea un poco tarde, y no puedes negar que tu viaje estuvo lleno de emociones.